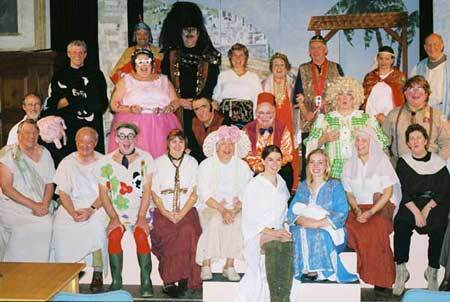 LIKE all the best am-dram productions Joseph and the Big Secret by Balcombe’s Victory Players had to overcome adversity as well as stage fright and forgotten lines in order for the show to go on. However, a broken arm, a lost voice and rain and wind as the cast ran repeatedly from one end of the Victory Hall to the other, via the car park, between scenes, were all dealt with in the true spirit of great British panto. Charles Metcalfe, as the “dame” Widow Carpenter, had abandoned his microphone by the second of the four evening performances after his booming voice diminished to a rasp in rehearsal. And the limitations of the hall’s backstage area, which meant actors and dancers were forced to wait in the “front of house” WI room instead of in the wings, and paddle Singing in the Rain-style through puddles between the two, did nothing to dampen their ebullient spirits. Joseph, written and directed by retired Cuckfield head master Jim Knight, was a wondrous mix of Christmas story and Jack and the Beanstalk panto with an ample dusting of fairy magic thanks to village shopkeeper, Anthea Bell, seen as never before in voluminous pink skirt and tiara. The contrast from the Victory Players’ previous performances, particularly their moving portrayal of Oh, What a Lovely War, which hung heavy with pathos and bittersweet tragedy, was stark as they tackled the extreme demands of slapstick. Their success varied from scene to scene and from evening to evening with Friday night benefiting from an audience that rose eagerly to the occasion and every joke, however laboured. However, this was village pantomime in the true sense with a cast of 30, plus children from the village dance school, and several dozen others, front and back stage, involved in making sure the show went on. It appeared no one who wanted to be in this show was excluded and the best stood shoulder to shoulder with the less good, and better for it the company was. The voices of Charlotte Marshall’s Joseph and Miranda Murray’s Mary were crystal clear while giant John Randall’s booming tones and Charles Metcalfe’s flamboyant dame lifted the show to rib-tickling heights. What a shame Balcombe’s beautiful Victory Hall cannot be extended, by even an innocuous few metres, to allow this cheerful company a little more space to change costumes and avoid the extremes of weather while they battle with the challenges of performance and their lines. OH NO I DON’T OH YES YOU DO! First a confession. I have never, even as a child, enjoyed pantomimes, so this review comes from a somewhat jaundiced critic. I am writing, of course, about the Victory Players JOSEPH AND THE BIG SECRET. Before I enthuse about the virtues of this production, and there were many, I must just explain some of my misgivings. While having my own difficulties about certain aspects of the “Christmas story”, I am doubtful that the events in the gospels fit comfortably within the traditional structure of a pantomime, however tenuous the connection. I also found the script somewhat derivative, encompassing too much of the Two Ronnies and Christmas crackers. But people tell me that is the essential nature of a pantomime. And finally, I would have liked tougher editing, a shorter first Act, and a less casual ending, more of a climax, before all the performers came on for their final bows. Now to the virtues. There was tremendous vitality between the whole team of performers who were clearly enjoying themselves. The two sets of young girl dancers were terrific and gave some lovely performances throughout. Anthea’s first entrance as a fairy was a tour de force, as was her performance throughout. But, how to mention the other stars of the show; there were so many of them. It took me a while to adjust to seeing Joseph (Charlotte Marshall) as an attractive young girl with a lovely singing voice, instead of the middle-aged man I believe Joseph actually was. Charles Metcalfe as Widow Carpenter had all the seductive guile of the traditional dame. Audrey Williams as Abigail, the naive dairy maid, charmed with her acting and singing, as did Mary (Miranda Murray). John Bunn, Chris Walker, Rodney Saunders and Mike Rayner (nice singing voice, too) gave strong performances. But so did all the others: sorry I have no space to mention you all. Congratulations, too, for the excellence of the costumes (Manuela Warburton) and the Set design (Eileen Knight and John Randall) and to all the ensemble actors and singers and the production team. All-in-all a very considerable achievement, especially when the immense difficulties of putting on any production in the Victory Hall are taken into account. 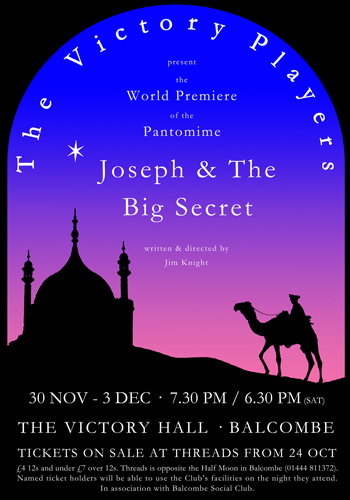 Click HERE to view a PDF file of the programme for Joseph and the Big Secret. To save, right click and select "save target as".